Abraham Geiger (l) and Heinrich Graetz (r). The Jewish experience in Germany has been variously described as a “mutual fructification,” by Michael Meyer, and as an “unrequited love,” by Gershom Scholem. Jewish historians were frequently the canaries in the mineshaft, forging the cultural climate for German Jews. The Wissenschaft des Judentums displays something of each characterization, and comparing two major figures, Abraham Geiger and Heinrich Graetz, sheds light on the relationship between Jewish historiography and the larger German community of historians. 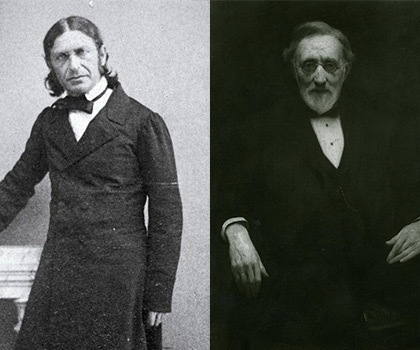 Geiger and Graetz were two controversial figures who wrote negative reviews of each other’s work and were given very different receptions by Jews in their day and by scholars in subsequent generations. Both Graetz and Geiger were pioneering scholars, yet they differed significantly in their philological methods, their religious commitments, and their broader concerns as historians. Graetz wrote a narrative of Jewish experience from biblical times to the present that reflects the imperialist culture of Europe of his day and that also provided a sense of national pride among Jews. Geiger applied philological methods to texts in order to illuminate the centrality of Judaism to particular historical moments, upending scholarly consensus. These differences are particularly sharp as they each delineate the boundaries between Judaism and Christianity, and Judaism and Islam. By examining their approaches, we gain insight into the ways in which they both sought not simply an assimilation into German culture and the German academic community, but something much more radical: a reconfiguration of the map of Western civilization. The impact of their work becomes apparent by examining its reception not only when it was initially published, but also by evaluating the long-term impact of their scholarship. 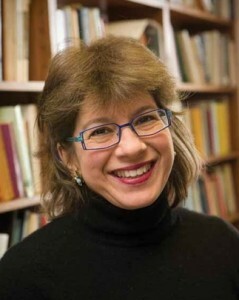 Susannah Heschel is the Eli Black Professor of Jewish Studies at Dartmouth College. Her scholarship focuses on Jewish-Christian relations in Germany during the 19th and 20th centuries, the history of biblical scholarship, and the history of antisemitism. Her numerous publications include Abraham Geiger and the Jewish Jesus (University of Chicago Press), which won a National Jewish Book Award, and The Aryan Jesus: Christian Theologians and the Bible in Nazi Germany (Princeton University Press). She has also taught at Southern Methodist University and Case Western Reserve University.